Last week we concluded the series of articles from Napoleon Hill’s first magazine publications. This week we begin sharing excerpts from one of Napoleon Hill’s greatest publications – The Law of Success. 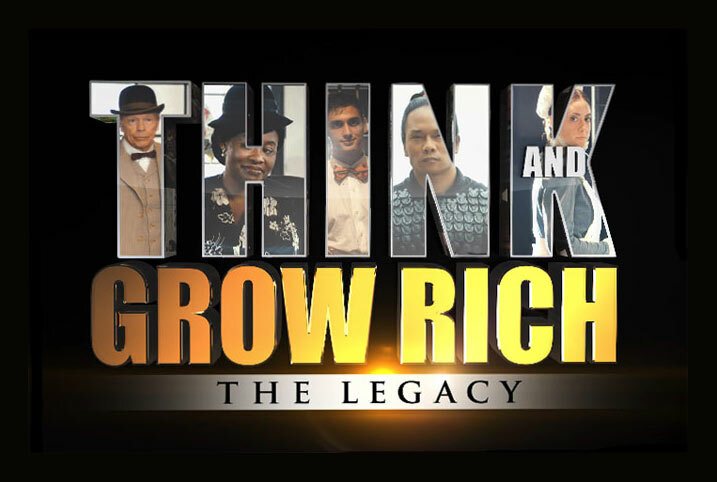 Napoleon Hill’s words have positively influenced millions of people worldwide. His books, lectures, magazine articles, and audio and video programs have shown them the way to personal and professional achievement. The Law of Success was originally released in eight volumes: beginning with the third edition, the eight volumes were combined into one facsimile volume. Napoleon Hill starts with the Mastermind Principle in The Law of Success. I know you will enjoy this next series of excerpts we will be sharing with you. Success is very largely a matter of adjusting one’s self to the ever-varying and changing environments of life, in a spirit of harmony and poise. Harmony is based upon understanding of the forces constituting one’s environment; therefore, this course is in reality a blueprint that may be followed straight to success, because it helps the student to interpret, understand and make the most of these environmental forces of life. Before you begin reading the Law of Success lessons you should know something about the history of the course. You should know exactly what the course promises to those who follow it until they have assimilated the laws and principles upon which it is based. You should know its limitations as well as its possibilities as an aid in your fight for a place in the world. From the viewpoint of entertainment, the Law of Success course would be a poor second for most any of the monthly periodicals of the “Snappy Story” variety which may be found upon the newsstands of today. 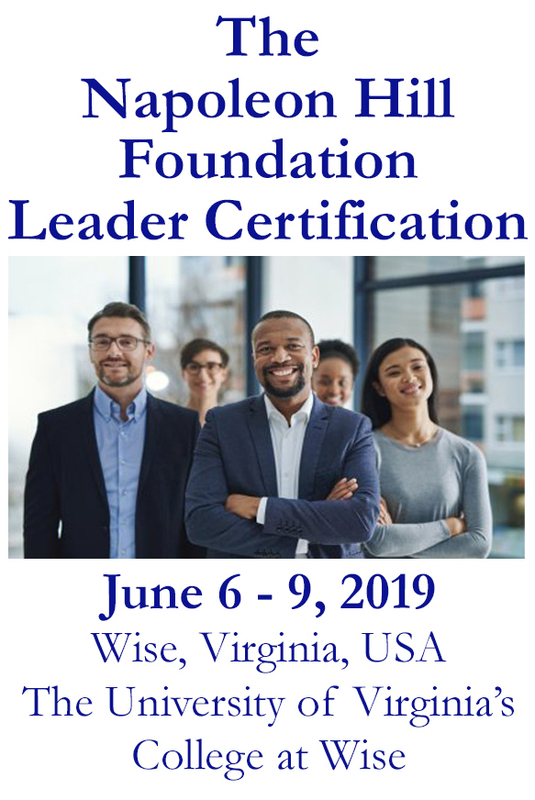 The course has been created for the serious-minded person who devotes at least a portion of his or her time to the business of succeeding in life. The author of the Law of Success course has not intended to compete with those who write purely for the purpose of entertaining. The author’s aim, in preparing this course, has been of a two-fold nature, namely, first—to help the earnest student find out what are his or her weaknesses, and, secondly—to help create a DEFINITE PLAN for bridging those weaknesses. All of these common enemies of mankind, and many more not here mentioned are covered by the Law of Success course in such a manner that any person of reasonable intelligence may master them with but little effort or inconvenience. You should know, at the very outset, that the Law of Success course has long since passed through the experimental state; that it already has to its credit a record of achievement that is worthy of serious thought and analysis. You should know, also, that the Law of Success course has been examined and endorsed by some of the most practical minds of this generation. The Law of Success course was first used as a lecture and was delivered by its author in practically every city and in many of the smaller localities, throughout the United States, over a period of more than seven years. Perhaps you were one of the many hundreds of thousands of people who heard this lecture. During these lectures the author had assistants located in the audiences for the purpose of interpreting the reaction of those who heard the lecture, and in this manner he learned exactly what effect it had upon people. As a result of this study and analysis many changes were made. The first big victory was gained for the Law of Success philosophy when it was used by the author as the basis of a course with which 3,000 men and women were trained as a sales army. The majority of these people were without previous experience, of any sort, in the field of selling. Through this training they were enabled to earn more than One Million Dollars ($1,000,000.00) for themselves and paid the author $30,000.00 for his services, covering a period of approximately six months. In this Introduction you will find a description of a newly discovered law of psychology which is the very foundation stone of all outstanding personal achievements. This law has been referred to by the author as the “Master Mind,” meaning a mind that is developed through the harmonious co-operation of two or more people who ally themselves for the purpose of accomplishing any given task. It is believed by this author that the normal or natural condition of the chemistry of any individual mind is the result of his physical heredity plus the nature of thoughts which have dominated that mind; that every mind is continuously changing to the extent that the individual’s philosophy and general habits of thought change the chemistry of his or her mind. These principles the author BELIEVES to be true. That any individual may voluntarily change the chemistry of his or her mind so that it will either attract or repel all with whom it comes in contact is a KNOWN FACT! Stated in another manner, any person may assume a mental attitude which will attract and please others or repel and antagonize them, and this without the aid of words or facial expression or other form of bodily movement or demeanor. Go back, now, to the definition of a “Master Mind” —a mind which grows out of the blending and coordination of two or more minds, IN A SPIRIT OF PERFECT HARMONY, and you will catch the full significance of the word “harmony” as it is here used. Two minds will not blend nor can they be co-ordinated unless the element of perfect harmony is present, wherein lies the secret of success or failure of practically all business and social partnerships. Every sales manager and every military commander and every leader in any other walk of life understands the necessity of an “esprit de corps”—a spirit of common understanding and co-operation—in the attainment of success. This mass spirit of harmony of purpose is obtained through discipline, voluntary or forced, of such a nature that the individual minds become blended into a “Master Mind,” by which is meant that the chemistry of the individual minds is modified in such a manner that these minds blend and function as one. MIND CHEMISTRY AND E C O N O M I C POWER: That mind chemistry may be appropriately applied to the workaday affairs of the economic and commercial world is a demonstrable fact. 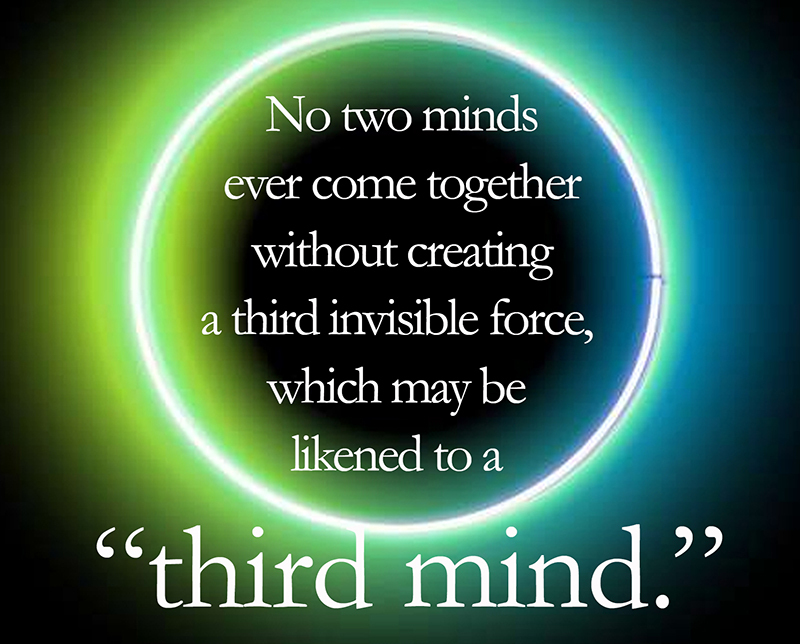 Through the blending of two or more minds, in a spirit of PERFECT HARMONY, the principle of mind chemistry may be made to develop sufficient power to enable the individuals whose minds have been thus blended to perform seemingly superhuman feats. Power is the force with which man achieves success in any undertaking. Power, in unlimited quantities, may be enjoyed by any group of men, or men and women, who possess the wisdom with which to submerge their own personalities and their own immediate individual interests, through the blending of their minds in a spirit of perfect harmony. Observe, profitably, the frequency with which the word “harmony” appears throughout this Introduction! There can be no development of a “Master Mind” where this element of PERFECT HARMONY does not exist. The individual units of the mind will not blend with the individual units of another mind UNTIL THE TWO MINDS HAVE BEEN AROUSED AND WARMED, AS IT WERE, WITH A SPIRIT OF PERFECT HARMONY OF PURPOSE. The moment two minds begin to take divergent roads of interest the individual units of each mind separate, and the third element, known as a “MASTER MIND,” which grew out of the friendly or harmonious alliance, will disintegrate. Recently, I had the opportunity to spend an afternoon fishing with my father. This is something I highly recommend. He and I spent a lot of time fishing when I was growing up, but now we seem to get out once or twice a year. I find that the fishing is irrelevant. The key is the outing itself and the time we spend together, as well as the lessons I learn. Fishing is simply an excuse to enjoy an afternoon outdoors with someone you love and respect. Fishing somehow makes it legitimate. If you were to take an afternoon off work, stand at the lakeshore, and talk, you would be considered lazy or unproductive. But if you hold a fishing rod during the process, it makes it all somehow legitimate. During this last trip, I couldn’t help but notice that my father and I were using the same equipment and standing in the same spot, but he consistently caught more fish than I did. I tried not to take this personally and tried to take notice of what he was doing differently from me. Finally, it occurred to me that he was casting out his line many more times than I was. He actually wasn’t catching more fish per cast, he was just simply giving the fish more opportunities to be caught. This is much like our success in life. The most successful among us may not have a higher percentage of success, they simply give themselves more opportunities to succeed. As a totally blind person, I am convinced that I could hit a baseball thrown by the best pitcher in the major league if you would allow me to swing as many times as I wanted to. When you look at your own career, life, or success, ask yourself: What is the one element that will do more to get me from where I am to where I want to be? Then, perform that critical element as much as possible. There are many sales seminars across the country designed to help those in sales and marketing to improve their closure rate. While these seminars may be beneficial, I would maintain that the easiest way to improve would be to simply make more sales calls. Let the percentages take care of themselves. Control the things you can control. If we could ever eliminate the time we spend worrying about things we can’t control, and invest that time focusing on the things we can control, we will be miles ahead. Focus on the important things in your day, and take every opportunity you can to go fishing. 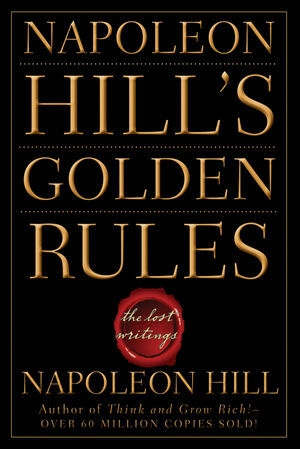 Napoleon Hill’s Golden Rules: The Lost Writings consists of a series of magazine articles Napoleon Hill wrote between 1919 and1923 for Success Magazine, of which he eventually become an editor. 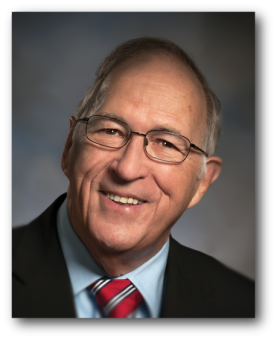 Hill’s obsession with achieving material success had led him from poverty stricken Appalachian Mountains with the desire to study successful people. These articles focus on Hill’s philosophy of success, drawing on the thoughts and experience of a multitude of rags-to-riches tycoons, showing readers how these successful people achieved such status. Many of his writings such as the chapter on Law of Attraction, written in the March 1919 issue, have recently basis of several bestselling books. Readers will discover principles that will assure their success if studied and put into action. This edition of Law of Success contains 4 volumes, the other three volumes are available on Amazon.com too. 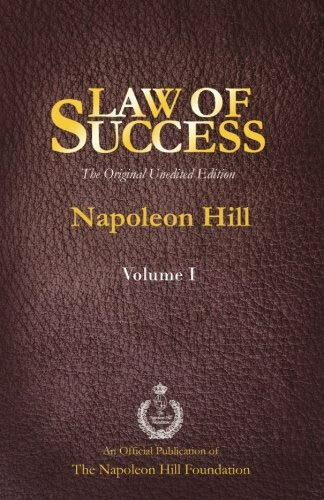 In response to popular de­mand, and with great pride, the Napoleon Hill Foun­dation and its Board of Trustees present this edition of Dr. Hill’s classic course, The Law of Suc­cess. 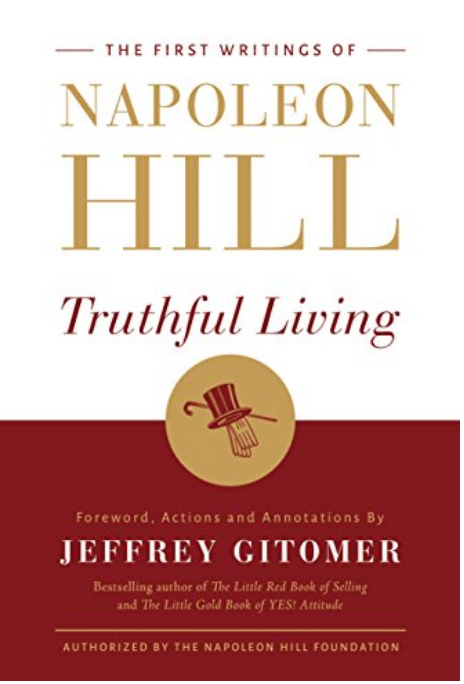 To preserve the integrity of Napoleon Hill’s ideas, the text of his first published work is largely un­modified. Our changes have been small. Specifically, The Law of Success was originally released in eight volumes: beginning with the third edition, the eight volumes were combined into one facsimile volume. Consequently, you will notice that the page num­bers start over every second lesson. Additionally, a few pages where the type had become illegible have been reset for easier reading. The universal message of The Law of Success remains unaltered, however. Because of changes in customs and word use, the language may some­times appear dated, but the underlying principles are as valid today as they were when Hill first pre­sented them in his dynamic and forceful style. In particular, his use of the masculine gender should be taken to connote “mankind” or “humankind” rather than men alone. No one would have been prouder or more excited by the advances of the women’s movement than Dr. Hill, who advocated equal rights and equal opportunity for all people long before it was fashionable. 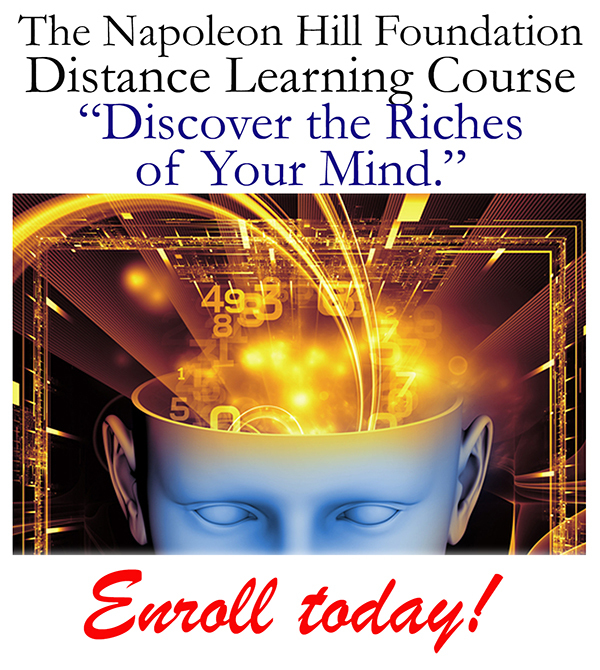 The Success Philosophy that Napoleon Hill pre­sents in this course and in his other works has with­stood the test of time. His principles of success have changed the lives of countless women and men from all walks of life on every continent. They can change your life, too, if you will apply them and get into action. 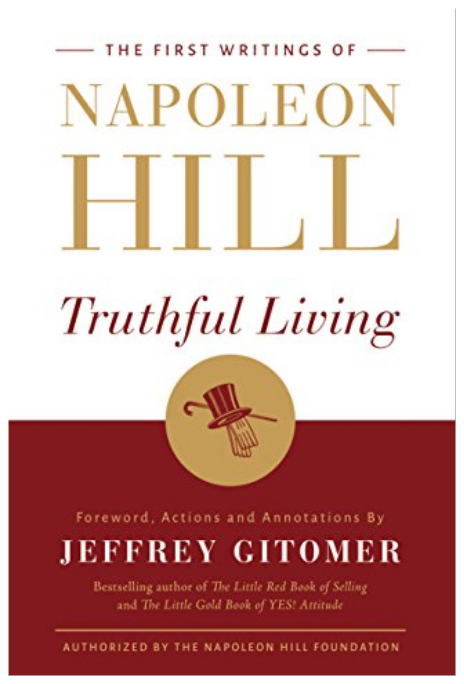 This power to change your life is the legacy of Napoleon Hill; that is the standard by which all works of motivational literature and programs are measured. 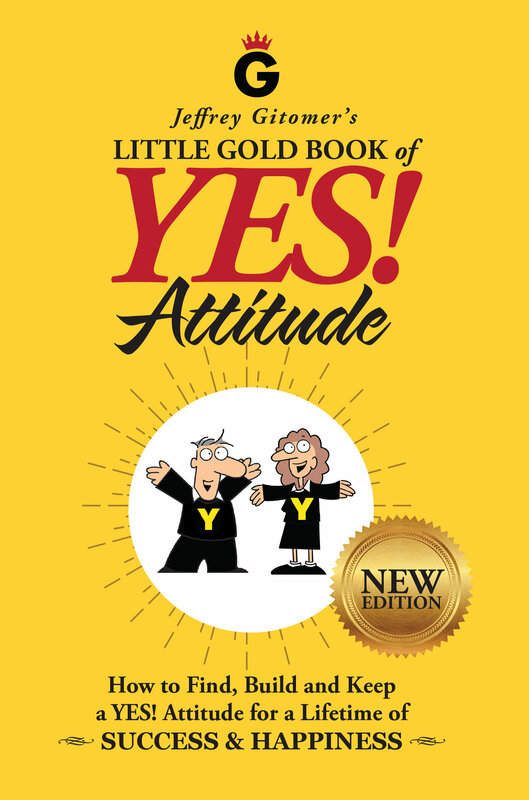 To attain your goals and know fulfillment in life, study, think, plan, and apply the principles this book has to offer. To merely read and agree with Dr. Hill is to miss the crucial point of his philosophy: Success comes only when you act on what you know and believe.